American manned spacecraft. Study 2012. The Draper-MIT CEV proposal was an 8-metric ton integral ballistic capsule. AKA: Crew Exploration Vehicle. Status: Study 2012. Gross mass: 8,000 kg (17,600 lb). Height: 3.50 m (11.40 ft). Diameter: 5.00 m (16.40 ft). The Draper approach was to design for the ultimate Mars mission, and then work backwards to apply those elements to the lunar landing. An exhaustive analysis of alternatives, taking NASA comments into account, resulted to very different conclusions between the mid-term and final reports. The midterm CEV proposal was an integral biconic lifting body with a L/D of 0.6. When used for the LEO mission, would provide 14 days of life-support for four crew in a 60 cubic meter cabin with 22 cubic meters of habitable volume. 7.72 m long and 5.0 m in diameter, with a mass of 8100 kg, it was sized to allow launch be a single-booster Delta IV Medium or Atlas V EELV. The entire CEV would be recovered. 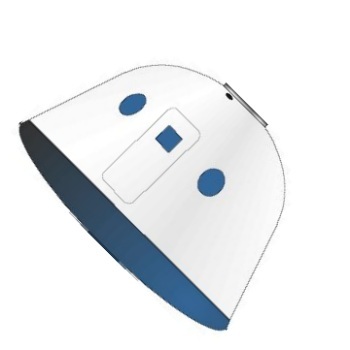 For extended lunar missions, inflatable habitat plugs and end-caps would be landed separately from a CEV direct lander. These plugs would have a pressurized volume of 114 cubic meters, and loaded masses of up to 21 metric tons. Landing on the moon would require additional propulsion stages, which would be common with those used for later Mars expeditions. These stages would burn liquid oxygen and methane. Since the hardware was being developed mainly for Mars, Draper used a lunar polar base with direct landing of components on the Martian surface as best mimicking Mars operations (e.g. no L1 or lunar orbit rendezvous operations). Draper looked at two approaches. In the first, the equipment was designed from the beginning for the later Mars expedition, and demonstrated and tested on the moon. In the second, modular equipment would be designed for both the moon and Mars, with propellant tanks and engines being grouped to obtain optimum vehicles for each mission. The first had a lesser mass penalty (6%) for suboptimal design for the Mars mission than the second (10%). The first approach seemed preferable and the following description covers that. Two types of liquid oxygen/methane stages would be built. The smaller would have a structural mass of 1402 kg, and be capable of holding up to 12,408 kg of propellant. It would be powered by an engine with a mass of 263 kg and a thrust of 76 kN. This stage, fully fueled with a CEV, would have a delta-V of under 3 km/s. Draper emphasized the ultimate Mars mission, and did not specify an optimum lunar landing mission design, or a launch vehicle recommendation. But this CEV/stage combination would have to be refueled on the lunar surface after landing in order to get back to earth. This could be either propellant stored in the waiting separate cargo lander, or that later generated by the ISRU plant. On later Mars expeditions two of these stages would be used in tandem. Following aerodynamic braking in the Martian atmosphere, both stages and the CEV would be landed on the lunar surface. Both would be needed to get the CEV into Martian orbit or on direct trans-Earth injection from the Martian surface. The larger stage would have a structural mass of 8,418 kg, with a maximum propellant load of 74,495 kg. It would be powered by an engine weighing 1042 kg and having a thrust of 447.7 kN. For lunar missions this stage would land a payload of over 42 metric tons on the lunar surface - a habitat consisting of two plugs and/or other cargo. 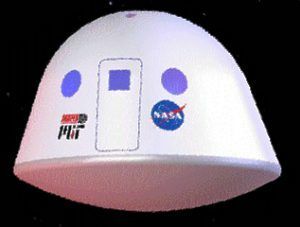 For the Mars expedition, it would be the propulsion stage for the Interplanetary Transfer Habitat, which would consist of three habitat plugs and a CEV. Either the CEV lander or cargo lander would be sent toward the moon using an (unspecified) liquid oxygen/liquid hydrogen trans-lunar injection stage. Mission 1: Equatorial landing of a single CEV, no habitat, no rovers. This would prove precision manned landing techniques. Left behind in lunar orbit would be navigation, science, and communications satellites that would be part of the lunar infrastructure. Mission 2: Polar landing of a single CEV, no habitat, a single open rover. This would prove operations at the poles. Left behind on the surface for future use would be the rover, and some minor additional equipment. Mission 3: Polar landing of a single CEV, a single habitat, a single open rover. This would be a medium term stay, with longer scientific traverses, over a complete one-month lunar day/night cycle. Left behind at the base would be the habitat and the second rover. Mission 4: Polar landing of a single CEV and a pressurized rover. This would allow even longer scientific traverses, with overnight stays away from the main base in the pressurized rover. Mission 5: Polar landing of a single CEV, a powerplant module. This would be the first long-term stay. Mission 6: Polar landing of a single CEV, ISRU equipment. This would demonstrate surface resources utilization, including the operation of heavy equipment for mining, and the production of at least oxygen from either regolith or lunar ice. At the conclusion of this six-mission sequence, and operating lunar base would have been established as a prototype for the Mars surface base. It would include a pressurized rover, two open rovers, a habitat, a power generating plant, and an ISRU propellant production plant. All of these elements of the Mars expedition base would have been tested and proven, thereby greatly reducing the technical risk of moving on to Mars. The final Draper MIT CEV design was a stubby ballistic capsule with a hypersonic L/D of 0.3, supplied with average electrical power of 7 kW. The capsule had a pressurized volume of 27 cubic meters, of which 12.8 cubic meters was habitable volume. ECS consumables for 56 crew-days were provided, and a nominal crew of five could be brought back from Mars, and six from the moon. The CEV had no airlock, so EVA's would require the cabin to be depressurized. The CEV's subsystems were modular for easy reuse. Crew access was via a 1 meter diameter docking port forward, or an 0.8 x 1.8 m side hatch. The CEV was 3.5 m high, 5.0 m in diameter, with 20 degree slope sidewalls. For earth-orbit missions, the CEV would be fitted with a short 5-m diameter service module to provide rendezvous/docking/deorbit propulsion. Draper's final lunar mission design envisioned a direct launch by a heavy lift launch vehicle of the CEV to the lunar surface. This would have a payload of 60 metric tons in low earth orbit. Trans-lunar injection would be by a liquid oxygen/liquid hydrogen stage that would also be used for later Mars missions. Direct lunar landing and ascent would be handled by a single liquid oxygen/methane stage, that would also be common with later Mars landing hardware. Crew Size: 6. Orbital Storage: 9.00 days. Habitable Volume: 12.80 m3. Electric System: 7.00 kWh. Family: Lunar Bases, Manned spacecraft, Moon. Country: USA. Agency: NASA, Draper.